The arc which is struck by direct contact between the wire electrode and the workpiece, is maintained at a constant length by the interaction of electrical parameters. The power source used is invariably of the rectified dc type. Both, constant voltage and constant current type power sources are in use. Depending upon the work material, the shielding gas may be argon, helium, nitrogen, carbon dioxide, hydrogen, and their mixtures. When inert shielding gas is used the process is more popularly known as MIG (metal inert gas) welding and when CO2 is used as the shielding gas it is referred to as CO2 welding or MAG (metal active gas) welding. 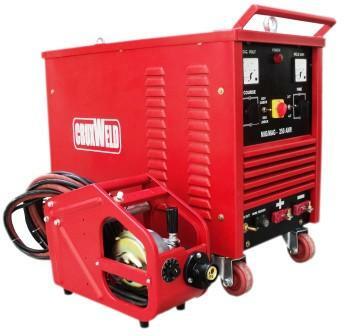 GMAW is an all-position semi-automatic welding process through its automatic versions is also available. GMAW is a very versatile process and can be used for welding all metals for which compatible filler wires have been developed. However, its typical applications include medium-gauge fabrication such as structurals, earth moving equipment, plate and box girders, and automobile bodies. This process has great potentials for use with robotic welding systems. This process, as the name implies, has been developed by combining the features of plasma arc welding and MIG welding processes. It has two variants; one with separate non-consumable tungsten electrode and the other uses the torch nozzle as non-consumable electrode. Essentially plasma-MIG welding process differs from the existing GMAW process in that the electrode wire is enveloped in a plasma sheath which controls heat and droplet transfer in such a way that much higher speeds and deposition rates are attained that possible with GMAW process. This process can be used both for welding and surfacing. Most of the materials that can be welded by GMAW can as well be welded by this process and at much faster rates. A welding transformer should satisfy the following requirements. It should have a drooping static volt-ampere characteristic. To avoid spatter, the surge of the welding current during a short circuit should be limited to the least possible above the normal arc current. The open circuit voltage should not normally exceed 80 volts and in no case 100 volts. The output current should be controllable continuously over the full available range. The open circuit voltage should be just sufficiently high for ready initiation of arc and not too high to impair the economics of welding. When a transformer supplies current, magnetic fluxes are produced around its windings. The lines of the resultant magnetic flux traverse the magnetic circuit and cut the primary and secondary windings. Some of magnetic flux due to primary current do not cut the secondary turns and vice-versa, since both have their paths in the air. In the other words, they are responsible for the reactance of the coils and the respective reactive voltage drops across them. As the current increases, the leakage fluxes also increase and so does the e.m.f. o self-induction. This is why an increase in the primary or secondary current results in increase in the reactive voltage drop across the respective windings. This type of welding transformer consists of a normal reactance, single phase, step down transformer and a separate reactor or choke. The inductive reactances and resistances of the windings in such a welding transformer are low, so that its secondary voltage varies but a little with the welding current. The required drooping or negative volt-ampere characteristic is ensured by the reactor placed in the secondary of the welding circuit. The welding transformer of the integral reactor type has a primary winding I, a secondary winding II, and a reactor winding III. Apart from the main limbs, the core has additional limbs carrying the reactor winding. The current is adjusted by means of moving core C placed between the additional limbs. In this welding transformer an isolated low voltage, low amperage dc circuit is employed to change the effective magnetic characteristics of the magnetic core. Thus, a large amount of ac is controlled by using a relatively small amount of dc, hence making it possible to adjust the output volt-ampere characteristics curve from minimum to maximum. For example, when there is no dc flowing in the reactor coil, it has its minimum impedance and thus maximum output of the welding transformer . In welding operation sometimes there is a need for current exceeding the maximum welding current obtainable from one transformer. 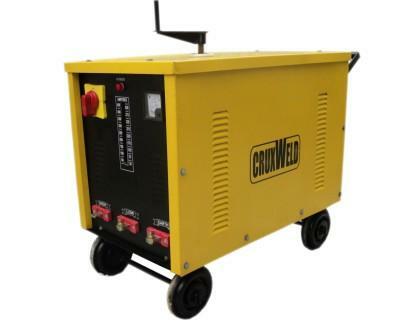 In such a case the desired welding current can be obtained by parallel operation of two or more welding transformers. The precaution needed for such a parallel operation is that the no-load or open circuit voltages of the transformer should be the same. 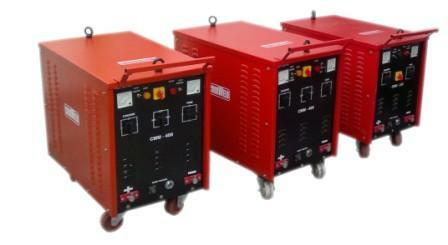 A multi-arc or multi-operator welding transformer system utilises a high current constant voltage power source for providing a number of welding circuits at the same time. Such a system is used when there is a large concentration of welding points in a relatively small operating area, for example, in ship-building, construction sites for power stations, refineries, and chemical plants. Use of the welding in today’s technology is extensive. Welding is used in every branch of science and technology. Such as computer industries, electronic industries, mechanical industries, petrochemical industries, etc. Arc welding machine 1st described by Davy in England in late 1809, but beginning of arc welding machine could become possible only the improvement in generator/dynamometer. Welding of metals by carbon arc was 1st suggested by a French person in 1881. In 1889, Zerner proposed an idea for twin carbon arc welding. In 1907 in America Strohmenger obtained another patent on flux coated electrode and 1st good welding joint was produced, he used asbestors coating with sodium silicate binder. Now a lot of changes and development have occurred for constituents of flux coating and core wire composition. In 1928 shielding of welding (CO2) possible by Alexender in USA. 1st TIG (Tungsten Inert Gas) welding machine and MIG (Metal Inert Gas) welding machine develop consequently in 1946 and 1948 respectively. Homogeneous Process: In the joining process filler rod (electrode) is used and two same metals are joining no pressure is applying during the welding process. Heterogeneous Process: In this joining process filler metal is soluble in both the parent metal which themselves are soluble in each other. Autogeneous Process: In this type of welding process no filler rod is used but pressure is extensively used. Resistance welding, forge welding, friction welding, diffusion welding are the examples of autogeneous welding. Ferrous metals such as low carbon steel, high carbon steel, stainless steel, cast iron, etc. (ferrous metals are those metals which are richer in carbon means having iron as a main constituents). Non-ferrous metals are those materials which are richer other than carbon such as Al,Cu, brass, nickel magnesium, zinc and its alloys. Welding joints are stronger as base metal. Machining are possible on welding joints such as (grinding, shapering etc.). Welding joints efficiency up to 100%. Appearance of welding joint is very good. Alteration and amendment is possible in existing structure use by welding. A large numbers of similar and dissimilar metals can be welded easily. Weld joints are light in weight. Welding is a permanent joint. 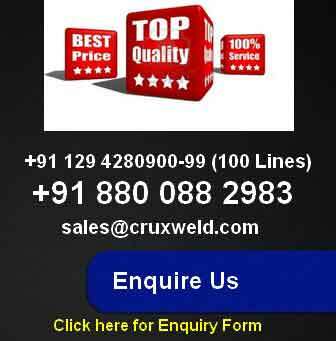 Skill person is needed for welding purpose. Ultra-violet rays and infrared rays generate during the welding process which harm full for operator’s skin as well as eyes. Distortion due to high temperature is possible in workpiece. Thermal stresses developed in workpiece heat treatment process are required to relieve the thermal stresses. Weld heat produces metallurgical changes in workpiece. Edge preparation is required before welding which is time and labor consuming process. Special jigs and fixtures are required for welding purpose. Welding joints are lighter in weight as compared to riveting and casting (process). Welding is more economical and much faster process as compared to casting and riveting. Welding joint have more tensile strength and rigid as compared to riveting and casting. Less cost involvement in welding as compared to riveting and casting. Welding produces 100% efficient joint which is not possible by any other joining process. Jig-fixture not so much required as compared in reverting and casting. Welding is a permanent joint while riveting and bolting are not permanent joint (temporary joint).